The second half of our evening is a wonderfully whimsical romp through some other compelling issues. New Line held a competition last year for new one-act musicals, a fascinating but almost non-existent genre. Of the twenty-eight shows submitted, Woman with Pocketbook was by far the most interesting and the most fun. In this society that values individual liberties as highly as we do, this show asks some interesting questions. What happens when our concept of individual freedom meets the rigid strictures of religion? How much room is there for individual choice in organized religion's view of God and heaven? And, more to the point, is a moral act truly moral if a person is forced into it? 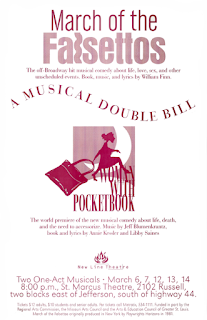 Both Woman with Pocketbook and March of the Falsettos [the other half of this evening of one-act musicals] are extremely funny and extremely irreverent. Both shows ask some tough questions and leave it to us to sort through the answers, to draw conclusions about love, relationships, family, and God. And after all, isn't that what theatre does best? In the spring of 1998, I received a call from a cast member of New Line’s Woman with Pocketbook. They needed an extra Angel and thought of me. It was my first experience at New Line and I was thrilled to be asked, but wasn’t sure what I got myself into. I found out that this Scott Miller guy really isn’t dealing with a full deck. I liked that about him, but he was asking the impossible from his “Angels.” The libretto called for numerous songs of different languages, one verse in Spanish, one verse in Italian, one in Russian, you name it. I was never sure if it was fake or not. Actually, I was never sure of the lyrics! But I wasn’t alone. Angels can be smart. When we didn’t know a line we would look at one another in the hopes somebody would. We each knew certain sections of the foreign lyrics, and among all of us, we could cover them and everybody thought we actually knew what we were doing. When I heard about this show and found out that Scott was looking for a “crooner,” I knew I had to be a part of it. Besides, how many other chances would I get to play GOD (typecasting of course), especially a God who drinks martinis and smokes cigarettes. Kind of a mix between Frank Sinatra, Dean Martin, and Michael Landon from Highway to Heaven. I remember we pondered hard over “What would God wear?” We had discussion after discussion, and then resolved ourselves to taking the most honest way out. A bright red jacket and black slacks! (Yeah, Scott wanted to take the traditional way, as usual.) Well, the reviews came out and there was hell to pay (pah-dum pah). It seemed that the St. Louis theatre- going public didn't want to see God portrayed in this manner, or at least a few reviewers didn't think it was in good taste. In either case, we gave people things to talk about, which is the whole purpose, right? I was glad that some got the joke and went beyond it to get the meaning and the meat of the production. When you die, you don't get to take the “stuff.” In the last moments, the only thing that matters is what you have on the inside and not what you have in your pocketbook. It was a relief to know that so many people already knew that. It is not often you get the chance to appear in the world premiere of a musical. I found myself as a twenty-four-year-old cast in the role of a sixty-year-old Jewish woman from Brooklyn, but I was so excited to be the lead! I was also terrified to try any accent on the stage, and Scott must have yelled out pronunciations from the piano at me a billion times in rehearsal. When we opened, the show seemed to really connect with many in the audience. It was rewarding to have so many people tell me I reminded them of their mother, their favorite aunt, their crabby neighbor, etc. My gestures onstage and in life became more deliberate, and I learned to stand my ground. Some may consider picking up characteristics of your role as unhealthy, but if you knew Doris, you wouldn't say that. She'd eat you alive. William Finn wrote three one-act musicals about a character (an alter-ego?) named Marvin: In Trousers, March of the Falsettos, and Falsettoland. Later, he and James Lapine combined the second and third chapters into a full-length musical called Falsettos, which enjoyed a healthy run on Broadway. So everybody keeps asking me why we're doing just March of the Falsettos. When the two one-acts were combined into one full-length show, they were altered, lyrics changed, things added and deleted, to make this new show more unified, more thematically consistent. So the first half of Falsettos became something very different from the one-act March of the Falsettos. In the full-length show, both acts are about Marvin and the development of his relationship with his lover Whizzer. The conflict is about whether or not Marvin and Whizzer can build a life together without killing each other first. But the one-act March of the Falsettos is about Marvin and his son Jason. In fact, Jason is the heart of March, a boy who needs his father to guide him toward manhood and yet who fears becoming who his father is. The question here is not whether Marvin and Whizzer can stay together. In March, Marvin can't sustain relationships with Whizzer, his wife Trina, or his psychiatrist Mendel. Marvin's only salvation is in sustaining his relationship with his son. The one-act isn't about romance; it's about Marvin growing up enough to help Jason grow up. The title of March of the Falsettos refers to the journey from childhood, when a boy's voice is soprano, to adulthood, when his voice changes and he becomes a man. Personally, I think March of the Falsettos is a more interesting show, a less conventional musical, a show about deeper, more complicated issues, a show that still deserves to be seen in its original form. I got to work with an incredible cast. Deborah Sharn, whom I had seen in other productions…I was finally going to work with her! I thought at the time: she is a diva goddess. (I do mean that in the good diva sense . . . are you a good diva or a bad diva?) Then I found out she truly is as wonderful off stage as she is on. I am very thankful to have a rich friendship with her now. Jim Merlo makes everyone look great. He is in the wrong profession. (Deborah and I enjoyed the kisses as much as you, Jim.) I would watch from the wings in amazement of his acting and characterization. He made every character come to life. For me it was the first time I really understood how a song can advance a plot, how to act a song and get to the inner meaning of the lyrics. The whole cast was wonderful to work with and I will never forget them.